Please click here to sell your Carl Oscar Borg painting or receive a free art evaluation of your piece. Click to review some of the paintings we've recently purchased by Carl Oscar Borg. Carl Oscar Borg (1879-1947) California Painter. Born from a poor family, Borg began copying pictures from books as a small child. At 15 he was apprenticed to a house painter and at 20 moved to London where he worked as an assistant to portrait and marine painter George Johansen. Carl Oscar Borg began to paint seascapes at this time. In 1901 he sailed for the U.S. and worked as a house and furniture painter in the East. While serving as a seaman aboard the S.S. Arizonian, he jumped ship in San Francisco in 1903 and decided to make California his home. Lacking funds, he walked the railroad track to Los Angeles. He became friends with artist WILLIAM WENDT who taught him painting techniques. Through the patronage of Phoebe Hurst, he was able to return to Europe to study art in Paris & Rome. Upon his return, Borg taught at the California Art Institute in LA, and spent six months in Honduras during 1908. 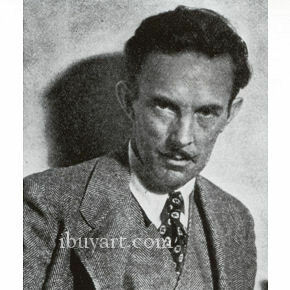 From 1918-1924 he lived in Santa Barbara where he taught at the School of the Arts. Carl Oscar Borg biography by Edan Hughes.